← Canadian Healthcare: It’s all about the Wait, Eh! If you want to know why Johnny still can’t read when he ‘graduates’ from high school, perhaps you should take a gander at the public school insanity known as Tenure. Look at what it takes to terminate a New Jersey teacher for poor performance, unprofessional behavior, and/or criminal acts of violence against a student. 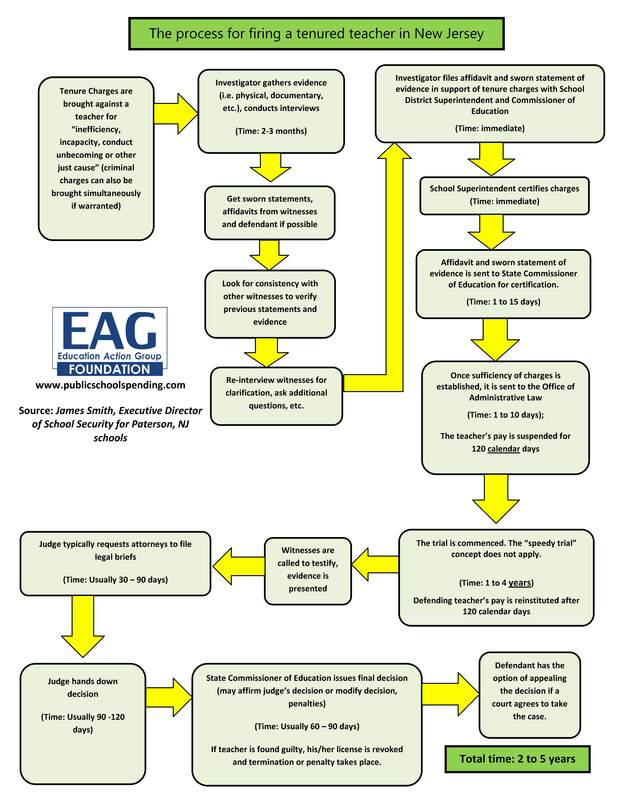 The following chart was developed by the Education Action Group and highlighted in an article by Kyle Olson on BigGovernment.com. It shows the convoluted steps involved in getting rid of the dead wood. And through most of this tortuous process, the failing teacher is getting paid while the school board, the students, and the taxpayers are getting screwed. During this time, the teacher’s pay is suspended for the first 120 calendar days. After those four months are over, the defendant’s taxpayer-funded salary is reinstated. The school district must then pay that salary for the length of the termination process, as well as wages to substitute teachers to cover for the defendant. Compensating incompetence. Paying for poor performance. Pillaging the public coffers. Ah, the plentiful perks of being a privileged public employee! This entry was posted in Political/Social and tagged big government, Education Action Group, Kyle Olson, New Jersey Education Association, NJEA, teachers' unions, tenure. Bookmark the permalink.